A giant has packed his possibles and trekked out to Frontier Partisan Valhalla. Edwin R. Sweeney might seem at a glance to be an odd candidate for any Valhalla. He was, after all, an accountant by trade. But the counting of beans was by no means the measure of the man. The man who rode into the final sunset yesterday, September 6, 2018, was the most important scholar to ride the borderlands of Apacheria since Dan L. Thrapp. Sweeney wrote biographies of Cochise and Mangas Coloradas, a monograph on the unsung Mexican scout Merejildo Grijalva, a dense, rich tome on the final Apache Wars and more. He was an “independent scholar,” meaning that he wasn’t backed by a university, and he did his work on his own hook. He wasn’t the writer Paul A. Hutton is; Sweeney’s great strength was as a researcher. His accountant’s temperament meant that he tracked down every detail, and he did extensive work in Mexican archives. That Mexican research is profoundly important, because a U.S.-centric view of the bloodsoaked history of Apacheria really misses the point. The Apache-Mexican conflict was absolutely central; it lasted through a couple of centuries (counting the Spanish era) and was much more intense than the comparatively brief spasm of violence in southeast Arizona an southwest New Mexico c. 1861-1886. 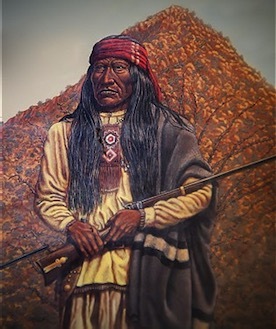 Sweeney’s biographies of Cochise and Mangas Coloradas will remain the foundation of scholarship on those two warrior chieftains till the rocks melt. 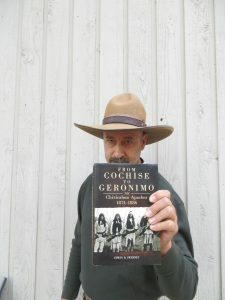 From Cochise to Geronimo tracks just about every move the last Apache militants made as they attempted to elude the forces of two nations in some of the most rugged terrain on earth. Speaking personally, Edwin R. Sweeney enriched my life tremendously. I tip my hat to him and I hope that the shades of Cochise and Tom Jeffords welcome him to an eternity of Story in some arid mountain land. I stand with you to mourn the loss of a giant, thanks for this tribute. Any one who is a reader of serious historical writing will miss the passing. Darn it Jim, every time I click on one of these articles you mention something else that I gotta have on my bookshelf! Well, I can’t be mad for knowing that a great source like this exists. Thanks for the heads up. Not only do I have to track this down, but now I gotta find out more about this Grijalva fella.